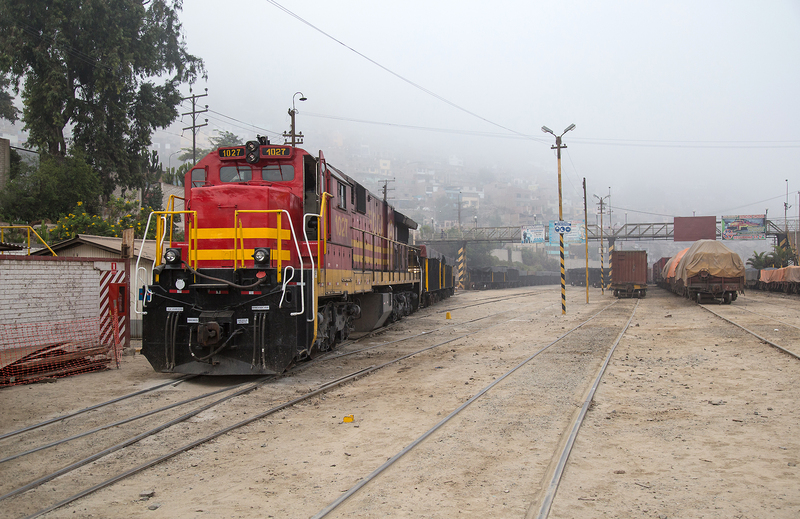 The Ferrocarril Central Andino is well known for being the highest railroad in the world although the lines status has been surpassed by the Chinese Railway line to Lhasa, Tibet. However if one wants to experience high altitude mountain railroading this is the place to go! 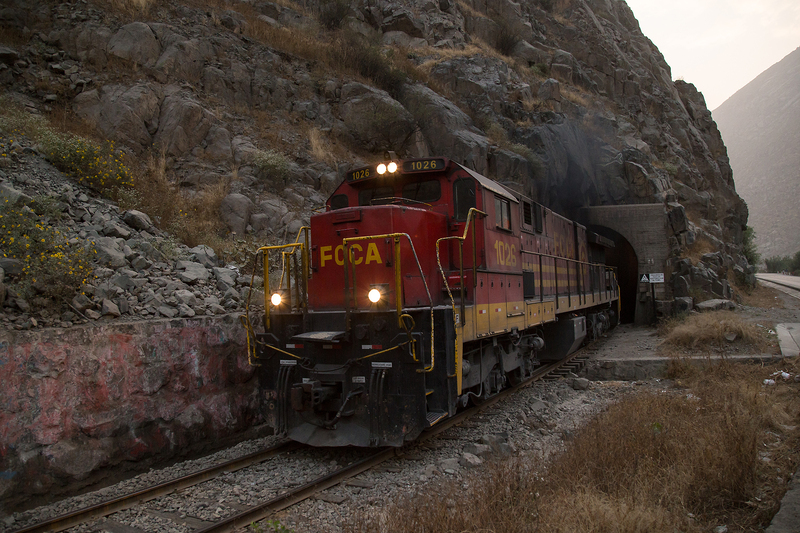 Unlike the Chinese railway which mainly traverses a vast alpine plateau similar to the Peruvian Altinplano the FCCA traverses some of the most difficult territory found on any railroad in the world; clinging to cliffsides, crossing high steel bridges over deep ravines, snaking up the sides of hills through switchbacks, a spiral tunnel and reverse curves before cresting the summit in a 3/4 mile long tunnel surrounded by snowcapped peaks. Construction began in 1870 under the direction of US Railroad builder Henry Meiggs and the railroad reached Chicla near the summit 8 years later in 1878. 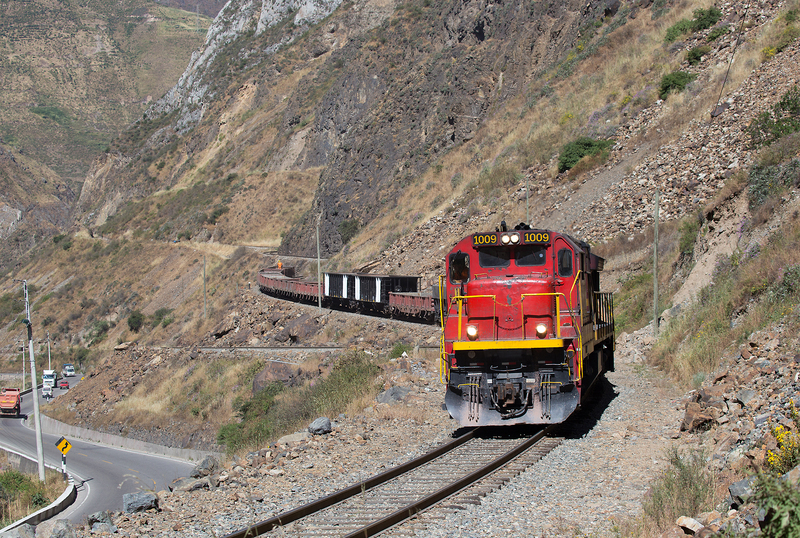 However the Peruvian-Chillean war in 1879 stopped progress for several years due to lack of funding and destruction of the existing line, it would not be until 1908 when the line reached its final destination of Huancayo. Due to the damage done to the Peruvian economy by the war the government could no longer afford to maintain and build the line so it was leased along with several other rail lines in Peru to the the newly formed Peruvian Corporation, owned by Englishman Michael Grace for 66 years. 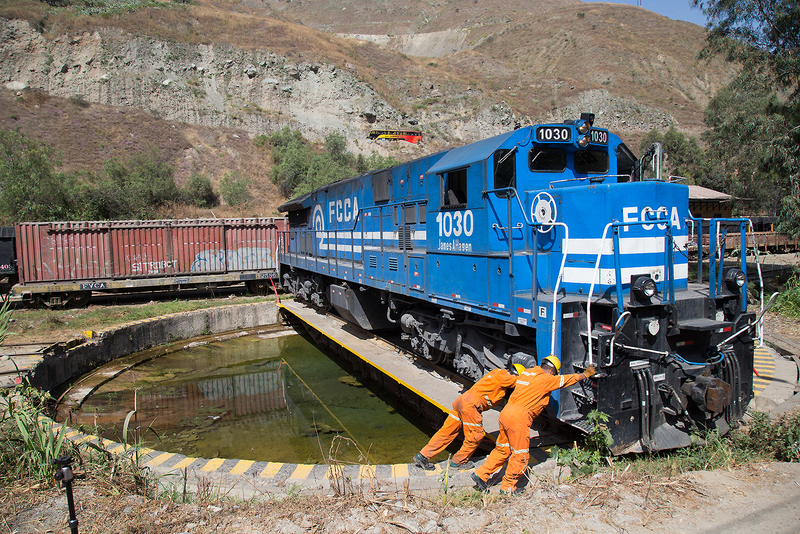 After the Peruvian Corporations lease ended the line passed to another private entity before being nationalised along with the majority of the Peruvian Rail network in 1972 under the newly formed ENAFER (Empresa Nacional de Ferrocarriles del Peru). However by the 1990’s the line was suffering from deferred repair, corruption and a host of other issues and the government chose to once again privatize the railway network. 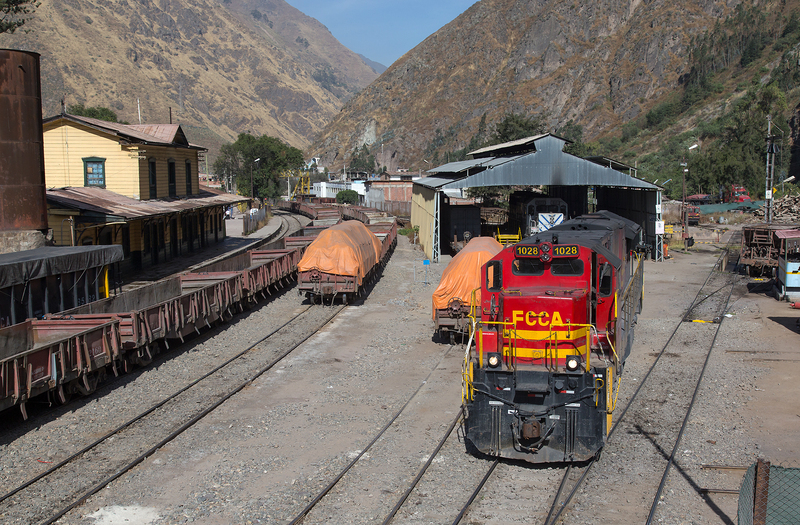 A consortium of Peruvian interests and Henry Posners Rail Development Corporation RDC won a 30 year concession and began operations as the Ferrocarril Central Andino. Under privatization the lines infrastructure has been greatly improved with bigger rail, new ties, and a vastly improved safety record. Of course for rail enthusiasts the most visible change has been the departure of the orange ENAFER ALCO DL560’s in exchange for a new fleet of remanufactured GE Dash 7 and Dash 8 locomotives adorned in FCCA’s bright red paint scheme. 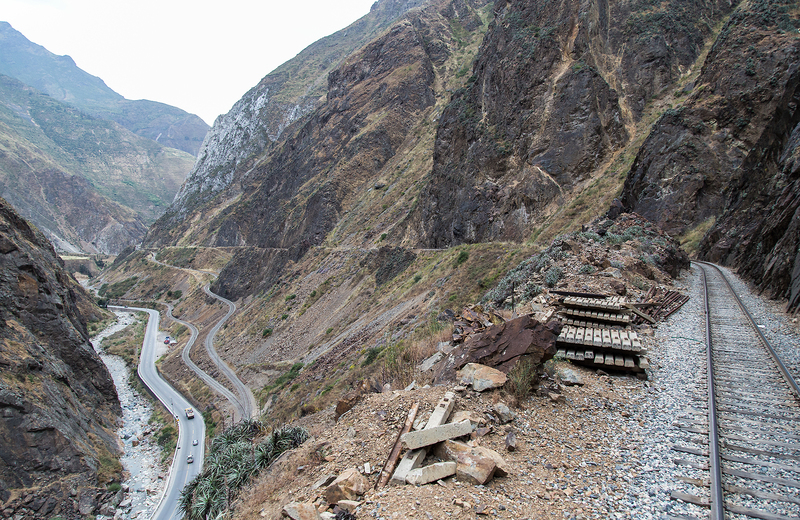 The 346 KM line to Huancayo begins in Callao, the port district of Lima, Peru, the capital of Peru. From there the line makes a cuts through the sprawling metropolis of Lima, passing the historic Desamparados Station where seasonal tourist trains still depart. From there the line follows the course of the Rimac River up to Chosica, the railroads headquarters. 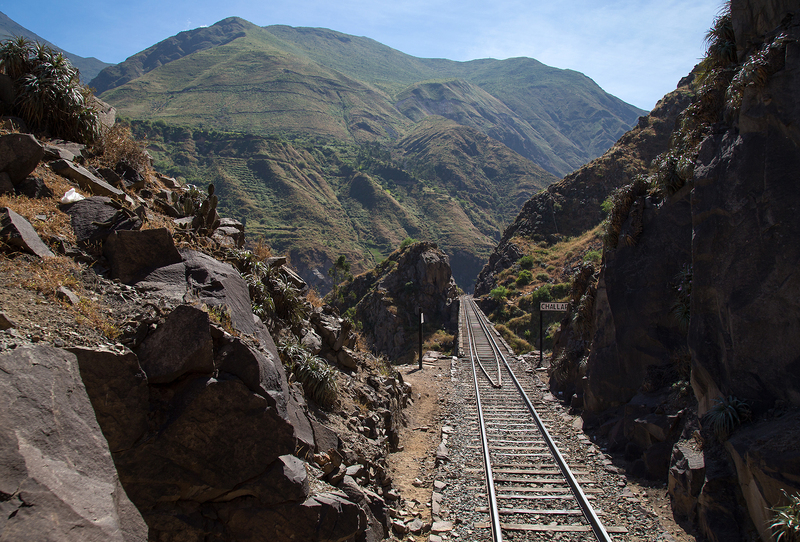 We decided to forgo exploring the line through the dusty, traffic filled outskirts of Lima and went straight to Chosica where the line goes from average to extraordinary. 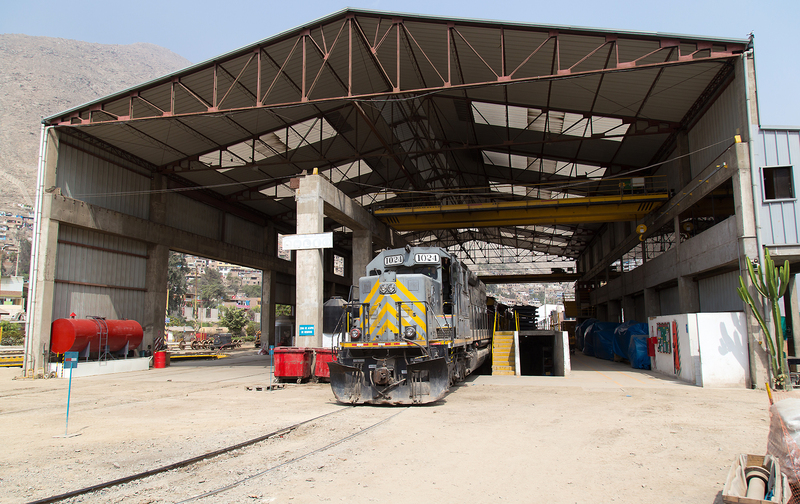 Here the railroad has a yard and their main locomotive shops, moved from Callao when the port was expanded. The railroad is dispatched out of the old depot, there are no signals so all dispatching is done with trainorders. The photos below will take you on a quick trip from Chosica to the lines summit at Galera. Later there will be much more detailed coverage including in cab videos of the scenic highlights of the line. The dusty yard in Chosica, it rarely rains on the Peruvian coast and a the area is generally covered in a mix of coastal fog and dust. SD40T-2 1024 sits outside inside the giant open air shop at Chosica. This shop was built to replace the Central Andino roundhouse which was demolished to make way for port expansion. A interesting variety of GE’s sit inside the shop at Chosica. Unmodified C39-8 1014 and C30-7SLP 1001 are in for repairs while a former NS C39-8 is undergoing rebuild which includes clearance modifications for the lines many tunnels. 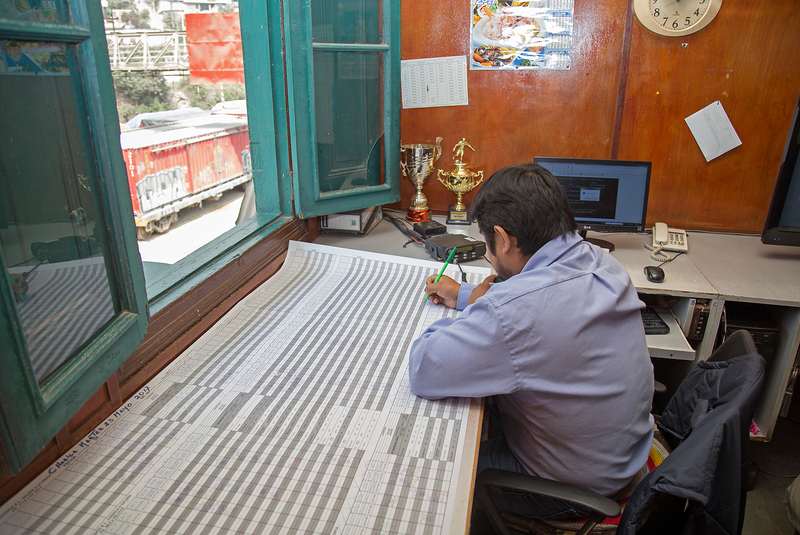 FCCA’s dispatching is still done via trainsheet and radio from the Chosica depot. C39-8 1026 emerges from Tunel 1 near Corcona as it begins its uphill hourney. The traincrew aboard Conrail heritage unit 1030 spins the locomotive around the manual turntable at San Batolome. 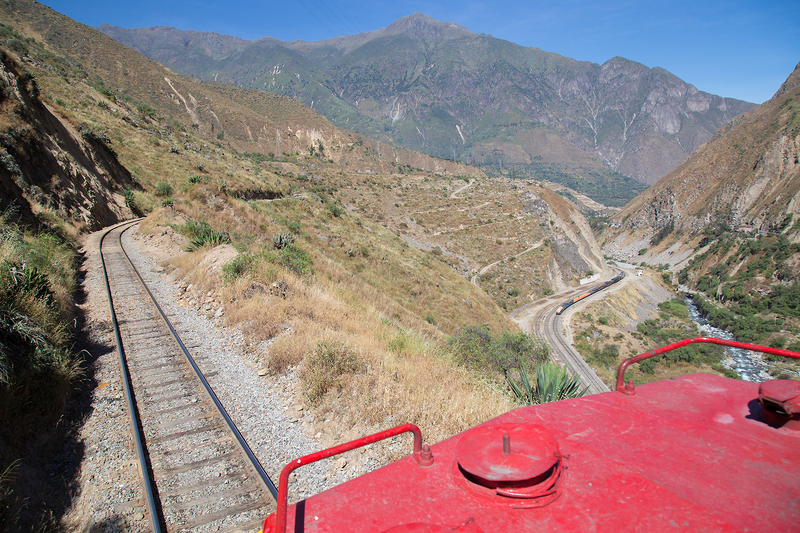 San Bartolome is a single ended switchback so all locomotives must be turned here. 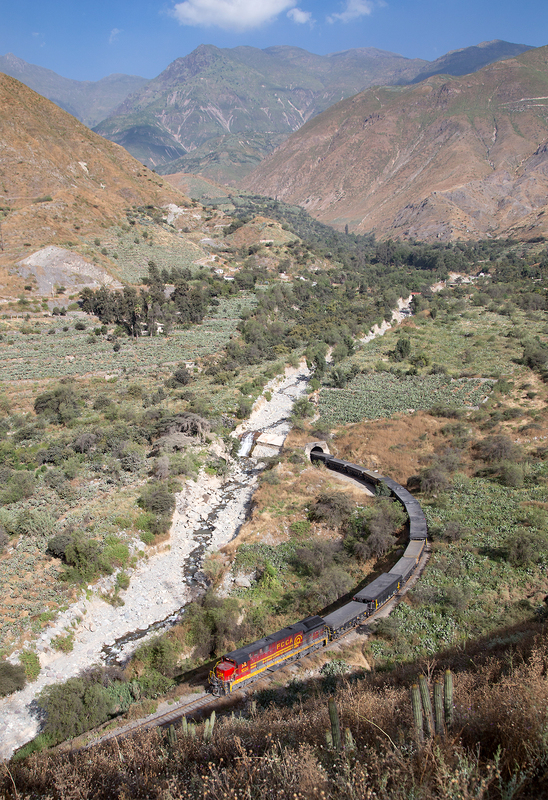 An uphill train curves through the first of a series of horshoe curves as the train climbs out of San Bartolome, the train will curve behind the photographer and then reappear on the hillside above the tunnel several minutes later. Passing through the Balta spiral tunnel which replaced a horseshoe curve that was washed away in a flood. On the second level of the Balta loops, the train has just come through the Balta tunnel from the lower level seen below. FCCA 1008 has completed its uphill journey through the Balta loops, all three levels are visible in this shot. 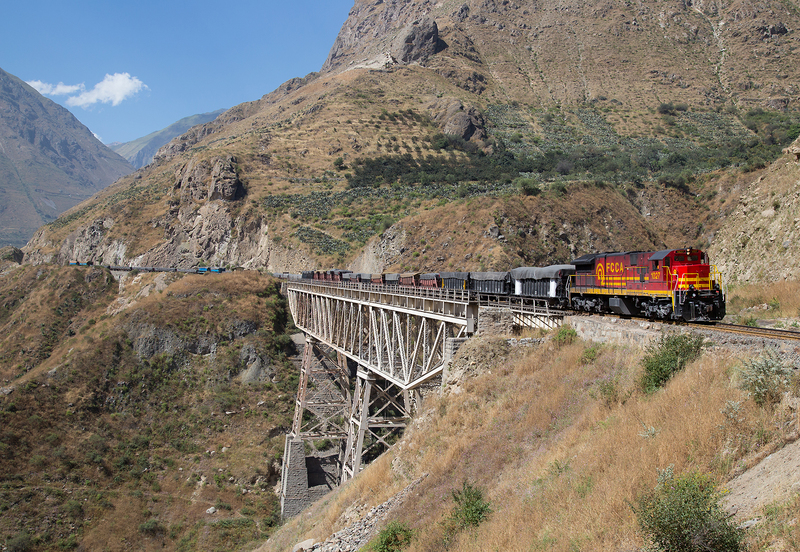 Shortly after the Balta spirals the train cross the Puente Challape over a seasonal ravine. The railroad maintains a running repair shed and a small yard in the town of Matucana. Matucana is the highest point that the unmodified SD40-2’s and C39-8’s can run due to tunnel restrictions further up the line and many trains stop here to change locomotives. Viso is the first full switchback on the line, FCCA 1009 is shoving an uphill train up the middle segment of the switchback. All three levels of the Viso switchback are seen from the rear platform of office car Paquita as we head uphill. Tamboraque is the second switchback, located just west of San Mateo. FCCA 1026 emerges onto the Inferillo bridge, easily the most recognizable location on the FCCA. Just east of Inferillo is the third switchback, Tamboraque. The train is seen on the upper level of the switchback heading uphill. East of Tamboraque the railway crosses the Carr Central twice on impressive steel bridge. 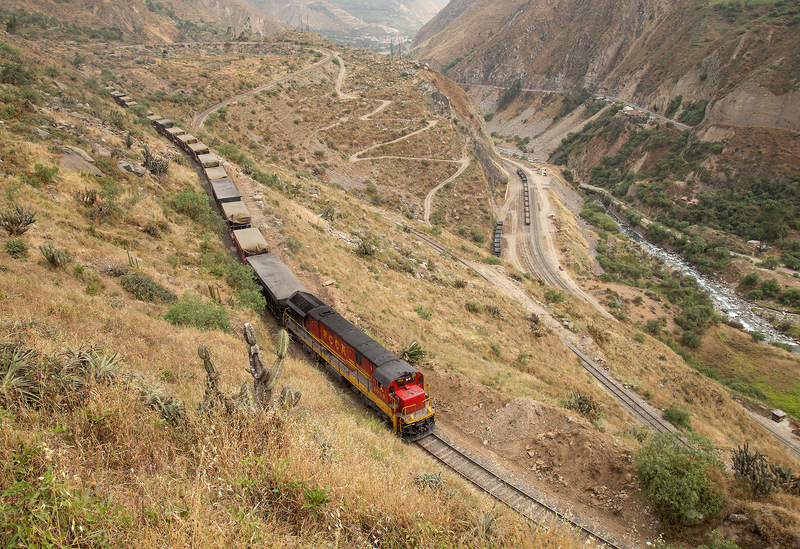 Two trains meet at the lower level of the Chicla switchback. The 1008s train is backed into a dead end tunnel while our train is using the dead siding to triple our train so we can shove up the hill. At the top of Chicla switchback. The town of Chicla can be seen in the valley in addition to the dead end tunnel and horshoe curve that encircle town. As we near Casapalanca the scenery changes to red sandstone cliffs and vegetation drastically thins out due to the extreme altitude. A uphill train passes through the industrial town of Casapalanca where the railroad services a mineral processing facility. The final switchback on the west slope is far less scenic than the rest, located in the industrial areas of Casapalanca. 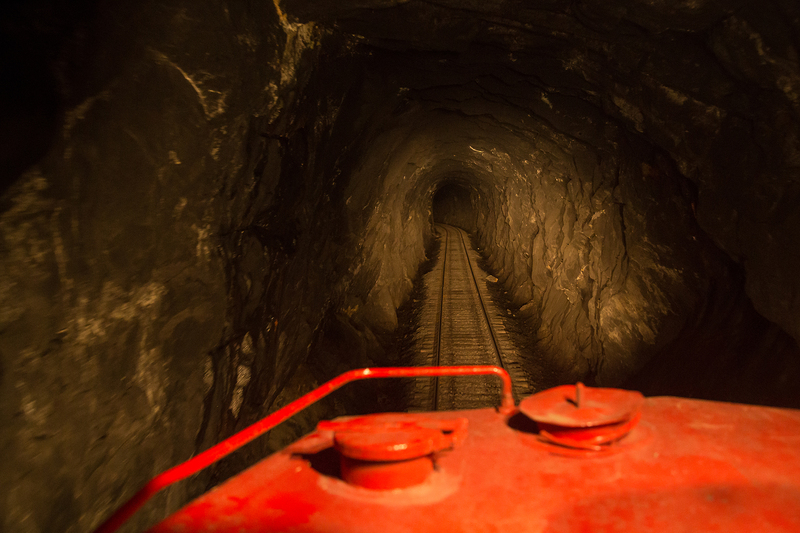 The last few miles to the summit are the most spectacular with the railroad darting in and our of sharp tunnels alongside a steep cliff. Nearing the summit FCCA 1009 rounds the curve at Ticlio. FCCA 1027 rests at Galera having crested the summit inside the tunnel. We are 15,681 feet above sea level, once the highest point on any standard gauge railroad. If you havn’t watched already check out the second part of the preview video for some in cab and lineside footage of the FCCA! You images are not just coverage to describe, but are stunning and attractive also. Thanks for your efforts to make the travel, catch the scenes, and then put this presentation together for others to enjoy. Thank you Bill and thanks for checking out the site. Means alot coming from a master like you! Excelente reportaje del FCCA. Una de las obras de ingeniería ferroviaria mas impresionantes en el mundo. Felicitaciones. i been 5 times to Peru but this is the Best ! Alots has changed but the mountains will always be there ! What number was the black locomotive that was modifying it? I’m curious, I see a worker all the way in back of the train in one of these photos, the one of Matucana. Is this just because they are starting on the switchbacks, or is it common to have workers riding there for security or something? The guy in the picture going up the switchback after Matucana is riding the last car so he can line the switch at the top of the switchback. The loaded downhill trains though will often have security guards riding the last car as theft and vandalism has been an issue. People have asked before, why are the hopper cars covered with a tarp? Being from USA I thought they were preventing dust blowing out of the cars into the surrounding area. Other people have suggested there are valuables in the cars and the tarp covers are protecting them from rain and theft. The railroad looks well kept and systematically being improved. All the geotextile fabric use at the upper altitudes looks like the company is building engineered system solutions for ongoing complex erosion problems. It hard to believe a train that moves at an average of 15 mph up hill can be as interesting as it is. The engine in the video sounds like an Alco. To move all that tonnage from near sea level to above 12,000 feet in about a day, that opens up a lot of possibilities for the right mining operation.